Cookies are small files stored in your browser by websites that you've visited. They contain information about your website preferences and can sometimes be used to authenticate you. For example, if you ask a website to 'Remember me' or similar, it is the cookie that keeps a record of this preference. Session cookies allow a website to remember your page changes and selections as you move from page-to-page. A shopping cart is a good example of this usage. A search engine may store cookies to fetch your search history and will display targeted adverts to you on various web-pages you visit. To maintain your privacy and security, you need to clear cookies from your browser periodically and evaluate your overall policy regarding allowing or blocking cookies. By default, IceDragon accepts cookies from the websites you visit. You can configure it to allow or block cookies , or to accept/block cookies on a per-site basis. The cache is a repository used to store web pages, images and other web content so that pages load faster on future visits. Some websites require you to download files in the background so the site runs faster and to keep information from being lost. These files, used by websites and keep in your local storage, can be removed manually. Select whether you want to delete cookies or cached content, or both. Confirm your choice by clicking 'Clear Now' in the confirmation dialog. 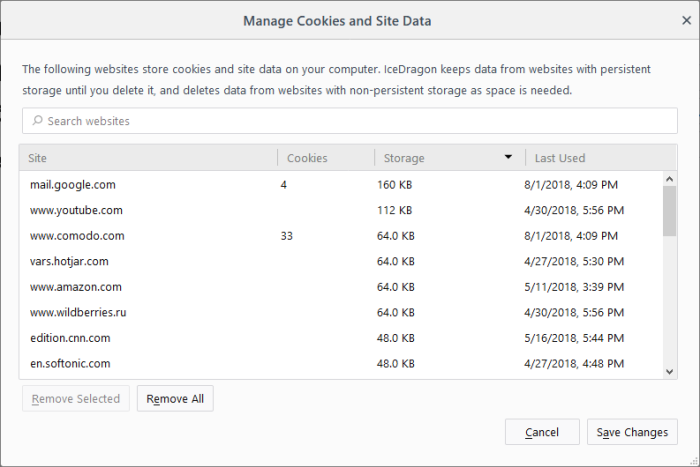 The 'Manage Cookies and Site Data' dialog lets you review and manage data stored on your computer by websites. To delete an item, select it and click 'Remove Selected'. To delete all items at once click 'Remove All'. Click 'Exceptions' beside 'Accept cookies from websites' checkbox. Enter the url of the website for which you want to allow or block cookies or site data permanently. 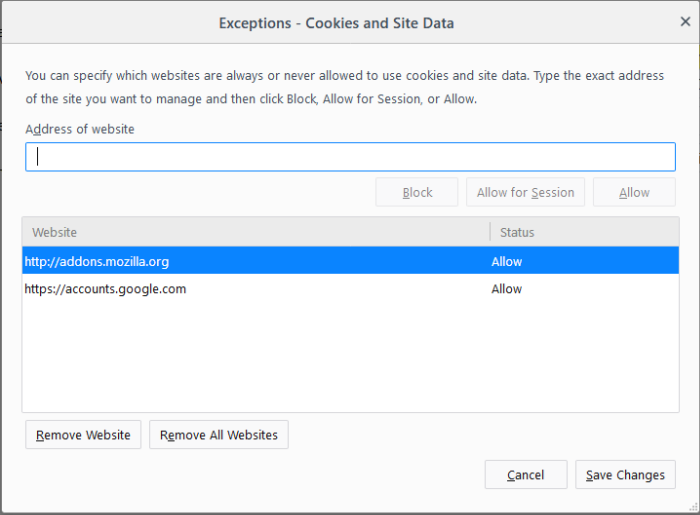 Click 'Block' to stop the cookies or site data from the site. Regardless of whether the checkbox 'Accept cookies and site data from websites' is checked or not, the cookies and site data from this site will be blocked. 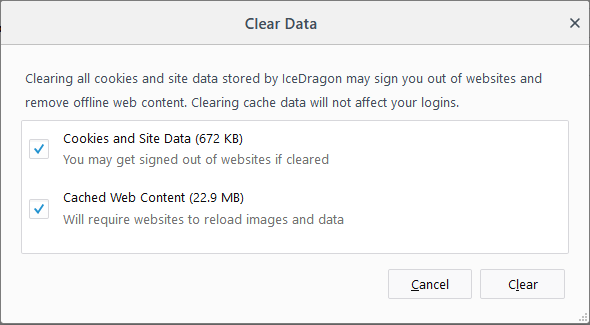 Click 'Allow for Session' to allow the cookies or site data from sites and remove them when IceDragon closes. Click 'Allow' to allow the cookies and site data from the site. Regardless of whether the checkbox 'Accept cookies and site data from websites' is checked or not, the cookies or site data from this site will be allowed. The website will be added to the list with the 'Allow', Allow for Session or 'Block status' as specified.